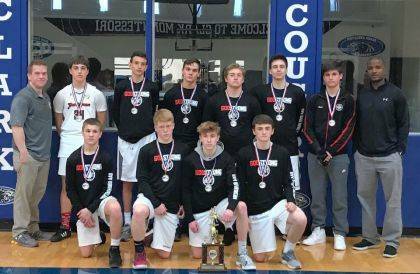 9th grade Black basketball team took 2nd place the weekend of April 21-22 at the Southwest Ohio Championship in Cincinnati. Front row: Ayden Sanford (Triad), Landen Hunt (Ben Logan), Kam Smith (Bellefontaine), Dalton Hannahs (Graham). Back row: Asst. Coach Ryan Hunt, Nolan Smith (Urbana), Riley Karnes (Marysville), Ryan Barlow (Marysville), Zack VanScoy (Graham), Jayden Streets (Ridgemont), Tanner LeVan (West Liberty), Head Coach Jason Randolph. Not pictured: Christian Ochs.